...takes old favourites that have changed and changed throughout the years as they've been adapted to work within our ever-evolving live show, and has them recorded properly in our makeshift basement-level studio. Fellow musician and close friend Jeff Waters (far right) has joined us this time around to sing and guitar around as well. Listen to the track "The Corner of Broadway" from The Basement Tapes Vol.1. 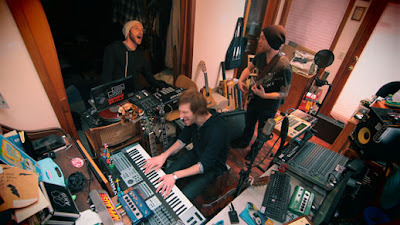 And then see how we do it down below in the "live in studio" version of Wooden Roller Coaster.